The concept of schizotypy or “psychosis proneness” captures individual differences in perceptual, cognitive, and affective experiences that may relate to a range of psychotic disorders. The concept is an important way to assess the contribution of pre-existing psychological and genetically based biological features to the development of illnesses such as schizophrenia (so called endophenotypes). The Oxford-Liverpool Inventory of Feelings and Experiences (O-LIFE) is a widely used multi-dimensional measure of the construct and consists of four scales which mirror several groups of psychotic symptoms: Unusual Experiences (UnEx; positive symptoms), Cognitive Disorganization (CogDis; cognitive symptoms), Introvertive Anhedonia (IntAn; negative symptoms), and Impulsive Nonconformity (ImpNon; impulsive and antisocial symptoms). For the purpose of evaluating the suitability of schizotypy as an endophenotype of schizophrenia the current version of the O-LIFE was translated into German: its psychometric properties (including re-test reliability and construct validity) were examined in a large sample (n > 1200) and compared to those of the English original. The German version was both highly reliable and consistent with the original. The study aimed to show that schizotypy as measured by the O-LIFE can indeed be regarded as an endophenotype of schizophrenia in terms of genetic associations regarding relevant dopamine-related candidate polymorphisms of schizotypy [i.e., Val158Met-polymorphism of the COMT gene, uVNTR of the MAOA gene, Taq1A-polymorphism of the DRD2 gene, VNTR of the SLC6A3 (DAT) gene]. We also wanted to compare the genetic associations of the O-LIFE to those published using other operationalizations of schizotypy. Our results show a large number of significant associations and borderline-significant trends between the O-LIFE sub-scales and a range of genes, thereby supporting using the O-LIFE in the search for endophenotypic markers. Endophenotypes, measurable components unseen by the unaided eye along the pathway between disease and distal genotype, have emerged as an important concept in the study of complex neuropsychiatric diseases. An endophenotype may be neurophysiological, biochemical, endocrinological, neuroanatomical, cognitive, or neuropsychological (including configured self-report data) in nature. Endophenotypes represent simpler clues to genetic underpinnings than the disease syndrome itself, promoting the view that psychiatric diagnoses can be decomposed or deconstructed, which can result in more straightforward-and successful-genetic analysis. However, to be most useful, endophenotypes for psychiatric disorders must meet certain criteria, including association with a candidate gene or gene region, heritability that is inferred from relative risk for the disorder in relatives, and disease association parameters. In addition to furthering genetic analysis, endophenotypes can clarify classification and diagnosis and foster the development of animal models. The authors discuss the etymology and strategy behind the use of endophenotypes in neuropsychiatric research and, more generally, in research on other diseases with complex genetics. We studied a large sample of male children from birth to adulthood to determine why some children who are maltreated grow up to develop antisocial behavior, whereas others do not. 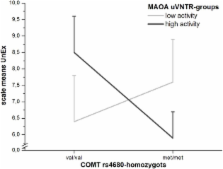 A functional polymorphism in the gene encoding the neurotransmitter-metabolizing enzyme monoamine oxidase A (MAOA) was found to moderate the effect of maltreatment. Maltreated children with a genotype conferring high levels of MAOA expression were less likely to develop antisocial problems. These findings may partly explain why not all victims of maltreatment grow up to victimize others, and they provide epidemiological evidence that genotypes can moderate children's sensitivity to environmental insults. The dopamine hypothesis of schizophrenia: version III--the final common pathway. The dopamine hypothesis of schizophrenia has been one of the most enduring ideas in psychiatry. Initially, the emphasis was on a role of hyperdopaminergia in the etiology of schizophrenia (version I), but it was subsequently reconceptualized to specify subcortical hyperdopaminergia with prefrontal hypodopaminergia (version II). However, these hypotheses focused too narrowly on dopamine itself, conflated psychosis and schizophrenia, and predated advances in the genetics, molecular biology, and imaging research in schizophrenia. Since version II, there have been over 6700 articles about dopamine and schizophrenia. We selectively review these data to provide an overview of the 5 critical streams of new evidence: neurochemical imaging studies, genetic evidence, findings on environmental risk factors, research into the extended phenotype, and animal studies. We synthesize this evidence into a new dopamine hypothesis of schizophrenia-version III: the final common pathway. This hypothesis seeks to be comprehensive in providing a framework that links risk factors, including pregnancy and obstetric complications, stress and trauma, drug use, and genes, to increased presynaptic striatal dopaminergic function. It explains how a complex array of pathological, positron emission tomography, magnetic resonance imaging, and other findings, such as frontotemporal structural and functional abnormalities and cognitive impairments, may converge neurochemically to cause psychosis through aberrant salience and lead to a diagnosis of schizophrenia. The hypothesis has one major implication for treatment approaches. Current treatments are acting downstream of the critical neurotransmitter abnormality. Future drug development and research into etiopathogenesis should focus on identifying and manipulating the upstream factors that converge on the dopaminergic funnel point. Copyright statement: Copyright © 2013 Grant, Kuepper, Mueller, Wielpuetz, Mason and Hennig. This is an open-access article distributed under the terms of the Creative Commons Attribution License, which permits use, distribution and reproduction in other forums, provided the original authors and source are credited and subject to any copyright notices concerning any third-party graphics etc. Impact of schizophrenia candidate genes on schizotypy and cognitive endophenotypes at the population level. Assessing Grief of Family Caregivers of People with Dementia: Validation of the Chinese Version of the Marwit-Meuser Caregiver Grief Inventory.